A stable injury, this fracture results from severe hyperextension and results in avulsion of the anterior inferior corner of a vertebral body, typically C2. The teardrop fragment is avulsed and is attached to the anterior longitudinal ligament. 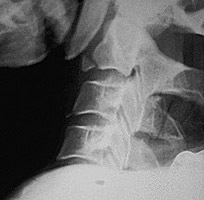 A Lateral radiograph of the cervical spine. This fracture from the anterior inferior corner of C2 resulted from severe hyperextension.